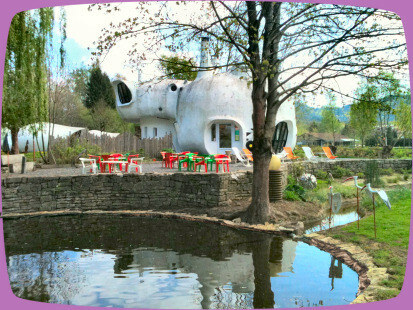 As you know, hotel boutique in Barcelona Ca la Maria likes recommends some of the hotel boutique most amazing and unusual in the world, and today the winner is Museumotel in France. Today this is my intention to introduce you into a dreamy place where fantasy, art and originality define this place, characterised by a series of areas form where a single artistic object in each element is an inextricable part of the whole. Hotel boutique in Barcelona is a lover of the most beautiful capitals around the world and, as the holiday season begins, what could be better than a vacation in France, Well, if you were dreaming of something like that, all that you would need to do is take a look at the cool bubbly Museumotel which is plopped down in the wooded landscape of northeastern in France, called Raon-l’Etape. The museumotel was designed in 1966 by architect Pascal Hausermann for hotelier M.Thierry and after opening in 1967 as a succession of buildings, the Museumotel complex fell into disuse and went bankrupt in 1995. Renovated in 2007, the 60s hotel was re-opened as a destination for visitors with an appreciation for retro design. In 2006 this hotel boutique was converted into a museumotel, and since there enjoyed the popularity and success it always deserved. The architecture of this place consists of pod like structures that are straight out of a science fiction movie. The structures are made of concrete veils and use layers of thermal insulation. So, the insides of the pod would be pleasant and warm even if it is freezing cold outside, and rooms are really cool and reflect a circular shape that is common in France. 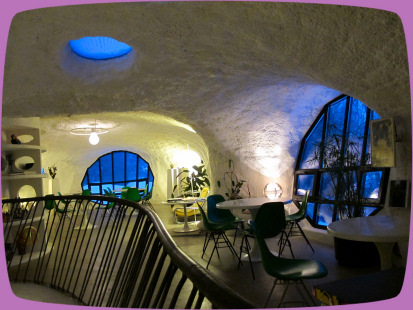 The interiors of the bubble houses reflect their frontage and consist of large circular rooms with curved doorways and arching staircases and its interiors have a pop-art atmosphere and each bubble has a different theme. This amazing place is situated on an island within a river and is only accessible by bridge and is surrounded by 41 acres of woods and a small artificial brook. So, book your tickets to France, go ahead, and enjoy!